On Monday May 7th, the Northern California Chapter (NCC) of the ARCS Foundation will host the 2018 ARCS Symposium, featuring research posters from 69 scholars in STEM disciplines at the Quadrus Conference Center in Menlo Park. Dr. Jeremy Reiter of UCSF, ARCS NCC Science Advisor will moderate oral presentations by 6 scholars. Dr. Reiter says that he is excited because “ARCS scholars work on a diverse array of problems, from the origins of Parkinson’s disease, to the impacts of climate change on the ecology of the Bay Area, to the genesis of stars.” Co-Chair of the Symposium, Dr. MJ Whitehouse adds “This is your chance to Meet the Minds of the Future”. World renowned astronomer, Professor Alex Filippenko of UC Berkeley and 2017 Symposium Keynote Speaker noted that most government funding for STEM supports scientists at the later stages of research – after promising results have “de-risked” the project. He endorses the ARCS philosophy of supporting young scientists who are often more likely to have the “break-through” ideas. Chapter President, Chris Simpson Brent says “The 2018 ARCS Symposium is an interactive forum that introduces our scholars to leaders in science, technology and venture communities of Northern California. 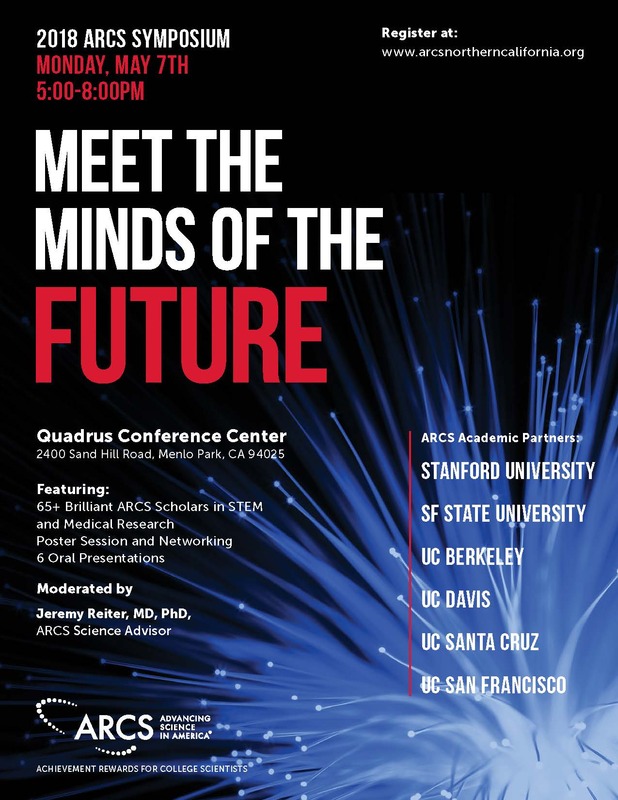 It is a great opportunity to connect with these smart young scientists.” Please register for this free event at www.arcsnortherncalifornia.org/2018-symposium. About ARCS: ARCS stands for Achievement Rewards for College Scientists. This national organization of women supports young scientists at the seed-stage of their research – a recognized funding gap. Since 1958, it has awarded over $100 million to >10,000 graduate students in STEM disciplines. Since 1970, the Northern California Chapter (NCC) has awarded $19.7 million to >2500 scholars, in collaboration with six universities: Stanford University, San Francisco State University, University of California at Berkeley, Davis, Santa Cruz and San Francisco (UCSF).